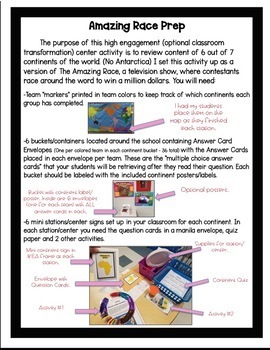 Do you need an interactive activity to fully engage your students after learning 6 of our 7 continents in our world? 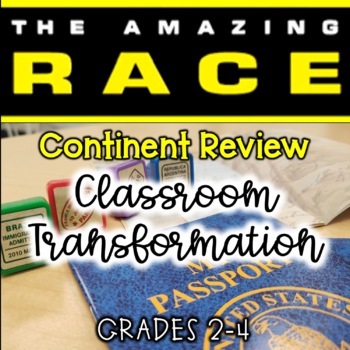 Grab this resource, transform your classroom and have them complete an Amazing Race challenge where they can work in centers on hands on activities.This is a great way to review the content you taught them about North America, South America, Europe, Africa, Australia and Asia. This resource is packed with over 65 pages you will use for your very own Amazing Race! Also included are about 10 pages of suggestions, set up tips, organization, supply lists and how to run this activity smoothly. 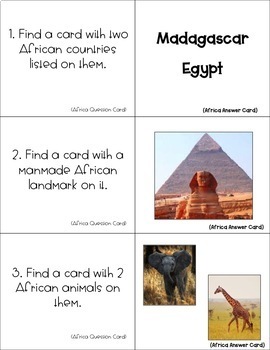 -6 continent quizzes with answer keys and a world map quiz. -Punch cards for your students to keep track of their completed activities. -6 "marker" cards to keep track of each team's successful completion. -Ideas for decor and items to use in your centers with the activities. For a better idea of what this looks like, check out my Instagram highlights (Amazing Race) @kaylynns_place to see how my class enjoyed it! Thank you for stopping by my shop. 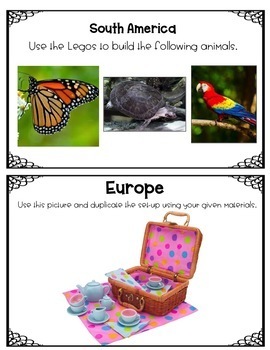 Check out some of my other classroom transformation ideas below.